Pretty Purplexing: Hockey can be a pain! All it took was a split second, checked at the wrong angle into the boards and SNAP, just like that, Brandon was injured. I could tell something was wrong the minute he skated for the bench. I could see him holding his shoulder. He tried to lift his arm and he couldn't. The trainer went over to examine his shoulder. It was at that moment I got up from the stands, ran around the rink to the players bench. My heart was pounding, I was freaking out. At first I was told we would have to take Brandon to the ER. 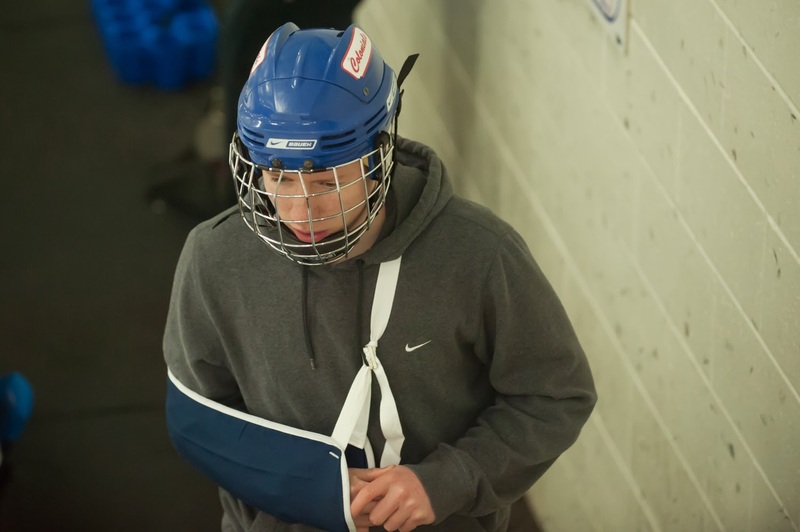 After removing his hockey gear, the trainer re-examend his shoulder and said he thought it was just a sprain and there was no need for the ER. The next day I took Brandon to a Sports Medicine facility. 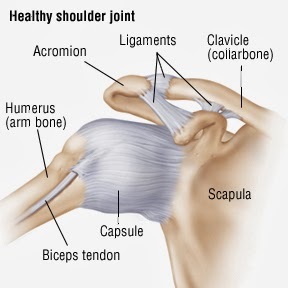 The doctor explained that Brandon has AC Shoulder Separation. Brandon is between the 2 and 3. 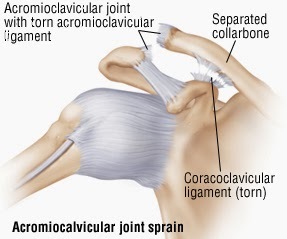 He has a severe tear in the ACL, but his collarbone is not separated. Right now Brandon is in a sling and taking Tylenol for the pain. He also has to put ice on his shoulder for 20 minutes every two hours. I am taking him back to the doctors to get another opinion and find out how long it will take to heal. As of now, he is out for the remainder of hockey season. Including play offs and The Flyers Cup. His high school varsity hockey team is in first place of their league and the play offs begin this week. His team was also selected to participate in the Flyers Cup. The Flyers Cup is a big deal for high school teams. It's like the NHL going for the Stanley Cup. I am so bummed that he cannot play in any of these games. He worked so hard all season only to have one check to the boards end it all. Hope he heals soon. It is disappointing I know. That's certainly disappointing news. As difficult as it is to be out for the season, it's probably better than rushing back and risking greater damage. I know how you feel though, my son blew up his knee on the basketball court, and it was wrenching for us to have to watch him not be able to play. Hope he gets well soon. Thank you Ken! It is very frustrating, disappointing and yes.. Gut wrenching to see him on the bench. I'm sure the feelings are multiplied for him.